The Sierra Vista Aquatic Center is a dream come true for a remote desert town with just 35,000 residents: The brand-new facility includes an unusual competition/wave pool along with an array of other features typically found only in more populous areas. In this feature, William Rowley and Scott Mackey of Rowley International describe what it took to create a facility that’s already transforming the lives of the town’s young – and young at heart. It’s one of those places you really have to see to believe. Part indoor waterpark and part competition facility, the Sierra Vista Aquatic Center is owned by the town of Sierra Vista, Ariz., a desert community of approximately 35,000 retirees and military families located near the sprawling Fort Huachuca army base. That’s about 50 miles south of Tucson – and about as remote as a town can get. Known locally as “The Cove,” the aquatic facility represents the town’s commitment to its citizens’ quality of life and a nod to the potential recreational water has to transform a community. From start to finish, the project took about four years and cost about $6.7 million, all paid for by the city. Designed by Tucson architect Scott Rumel, the basic facility was built by Lloyd Construction under the management of construction supervisor Leon Davis. Tucson pool builder Mark Ragel of Patio Pools set up the various watershapes, while our firm, Rowley International Inc. of Palos Verdes Estates, Calif., took care of the aquatic design and engineering. The facility opened in February 2002 and in its short life has already hosted a number of swim competitions and offered hundreds of families a wonderful place to exercise, play and relax. It’s truly a unique facility – one that is sure to enhance the lives of thousands of athletes and local residents who’ll be passing through its doors for years to come. From the start, the city leaders who spearheaded the project were intent on squeezing as much flexibility and functionality as they could into the design – no small challenge considering the modest budget with which they’d started. They wanted it to accommodate competitions and provide a place for children of all ages to play. They also wanted it to provide a hydrotherapy resource and swim time for the town’s large population of retirees. And all of these functions were to be housed in a natatorium not much larger than those with much less ambition. The key to the pool’s multi-function performance is a long, movable bulkhead that rises from a position flush with the pool floor to cut the main vessel in two. 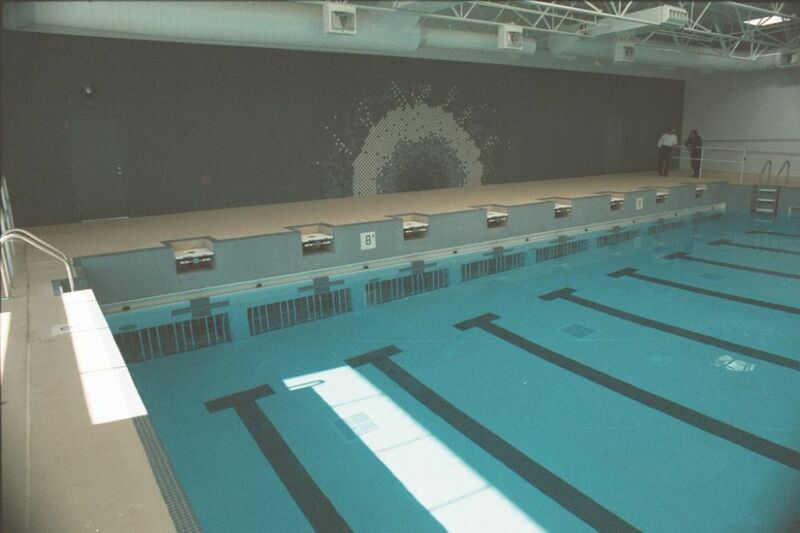 With the bulkhead up, the facility is ready to host competitions and/or lap swimming. With the bulkhead down, the vessel becomes a wave pool that pushes water the length of the main pool and up onto the fan-shaped beach entry. The scale of the bulkhead itself is impressive, as could be seen when it rolled up on a stretched flatbed (left). Well before that day, the slot had been prepared (middle), complete with a circulation system designed to keep water from stagnating. 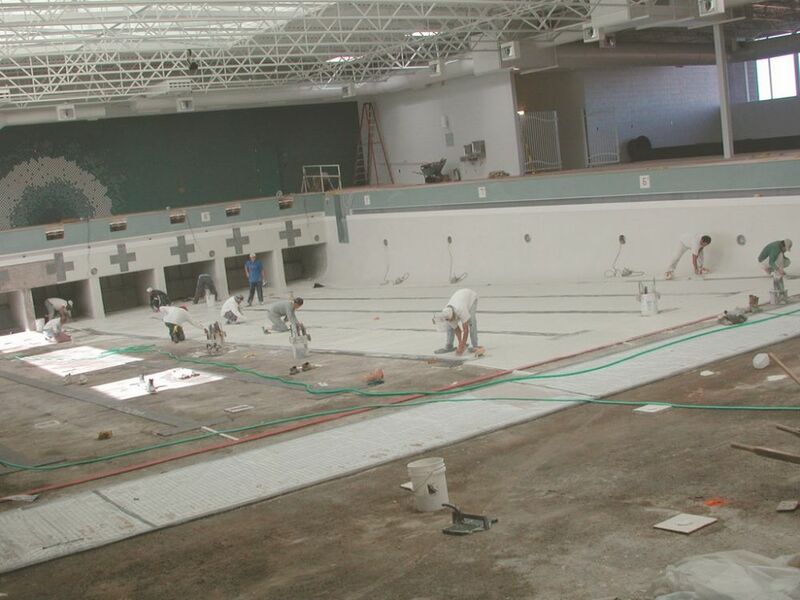 With the bulkhead lowered into place, work on then rest of the main pool continued in both directions (right). The central feature at The Cove is a 25-yard, 8-lane competition pool separated from a sprawling, fan-shaped, beach-entry pool by a submersible bulkhead. When the bulkhead is raised, the rectangular pool can be used for competitive or lap swimming, while the beach-entry area simultaneously serves the needs of those who want to wade, soak or splash. The real action starts when the bulkhead retracts into the pool floor and a four-chamber wave system generates surf that flows length of the main pool before lapping onto the beach. The main pool’s capacity of 425,000 gallons makes for some real excitement as the waves pass through the 10,500-square-foot pool and head for the shallows. Separating the beach area from the competition pool is a highly unusual submersible bulkhead. It disappears underwater into a cavity flush with the bottom of the pool so as not to create any obstacles for the wave-generating system or suffer any damage as a result of the wave action. Built by Natare Corp. of Indianapolis, Ind., the system is something like a submarine in that it contains a series of ballast tanks that are filled with pressurized air from a nearby 24-horsepower compressor. When filled with air, the bulkhead rises on its runners and is locked into position. When the air is released through a valve box on the nearby decking and the chambers are flooded, the bulkhead slowly lowers itself back into its niche in 12 minutes. Added fun comes from special areas set up around the facility, including a small shipwreck-themed slide that transitions from the beach area into a large shallow pool housing an 8-foot-high umbrella that doubles as an interactive waterfeature. Next to this “kiddy area” is a 750-square-foot hydrotherapy pool. Outdoors is a diving pool equipped with a pair of one-meter boards and a three-meter board. Finally, there is a 120-foot tube waterslide to one side of the indoor facility that uses 6,300 gallons of water. Users gain access to the slide on the inside of the facility, but the slide itself coils outside the building before dumping sliders into an indoor splash trough. The slide is made of a translucent blue material to enhance the indoor/outdoor experience and features automatic motion sensors that signal when the flume is clear and when it is in use. The entire facility covers 36,000 square feet and includes beautiful offices, locker rooms and sprawling decks. The building’s exterior is finished with blue and green tiles and stucco in a tasteful, modern style. The roof is fitted with skylights and the sides are mostly sliding-glass doors that take advantage of the bright desert sun and warm temperatures. All that glass also allows for spectacular views of the surrounding mountains. We at Rowley International were brought into the project in 1998, and the process was fairly typical. We went through all the initial phases, including preliminary design, schematic design, design development and construction documents, before shifting gears into the bidding and construction phases. In all, the preliminaries occupied about two years, with another two years devoted to construction, debugging and, finally, the grand opening. We were in luck in all stages because the Sierra Vista facility is loosely based on an aquatic facility in Lake Havasu City, Ariz., that offers a similar range of functions and features. The architect consulted with the officials at Lake Havasu City about adapting some of the multi-use features in Sierra Vista and so had a much clearer idea of what was involved than he would have had without such a model. The fact that the main vessel functions as both a competition pool and wave pool made for some unusual configurations in the gutter system and in the way we set up diving platforms and other fixtures. With the pool’s side walls raised to contain the waves, for example, the diving stands had to be inset below deck level (left). And to avoid obstructions along the side, ladders had to be recessed into the walls (right). But there were also some key differences between the two facilities. 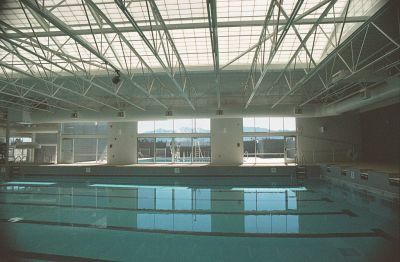 While both feature indoor wave pools, Sierra Vista also has its outdoor diving pool as well as a shallow-area configuration not found in Lake Havasu City. Those distinctions aside, where the Lake Havasu City precedent most came into play was in helping the Sierra Vista team streamline the process of programming for the new facility. This process involved the parks and recreation department and local school officials as well as persons representing local retirees – and each group had sets of needs it wanted met. 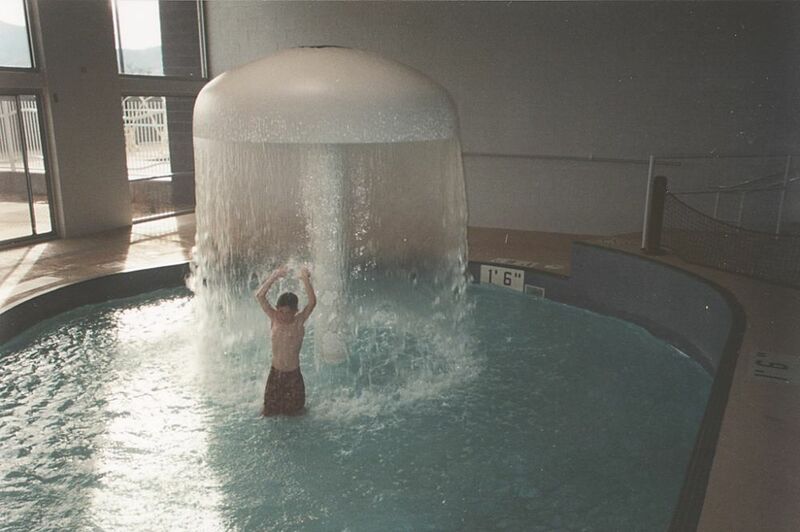 The wave-making system, supplied by Great Wave of Ashland, Ohio, consists of four large fans that push air into four chambers located below the starting blocks in the competition/wave pool. The chambers are full of water when the pool is static; when air is forced into the chambers, the water is suddenly and forcibly displaced into the pool via special grates located at the bottom of the deep end’s wall. The system is programmable and can be used to create eight different wave patterns according to sequences of air being forced into and out of the four wave chambers. The wave forms as the pool’s depth rises from 8 feet to 5 feet and then dissipates, fanning out onto the beach entry at the far end of the pool. 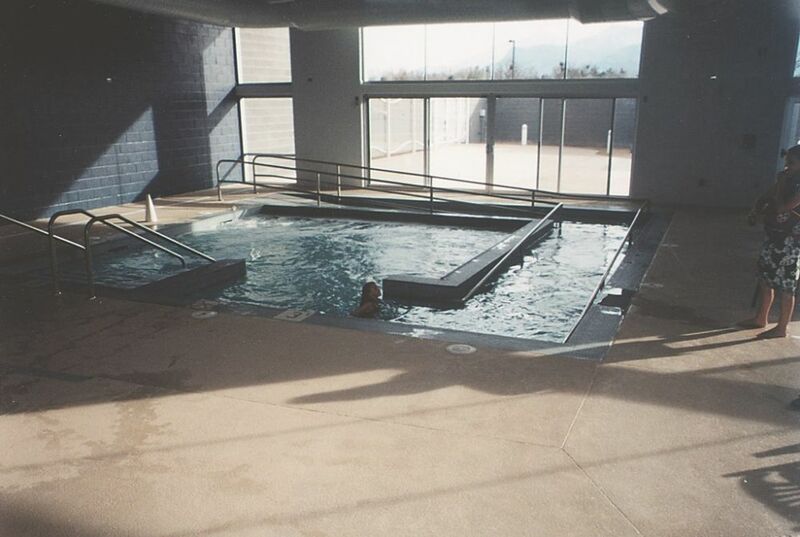 One result of this process, for example, was inclusion of a large therapy spa fitted with an enormous access ramp to ease entry and egress from the warm water. It also resulted in placement of the therapy pool adjacent to the kiddy-pool area so that parents and grandparents relaxing in the warm water can keep their eyes on small children playing nearby. The kiddy area also drew lots of programming attention that led to installation of both the water umbrella and the shipwreck slide. At 18 inches deep, this play area is connected physically to the larger beach area, so when the wave machine is operating there’s a small amount of residual water movement that adds interest and a bit of excitement to all-out child’s play. When you consider all of the programming details, from the water effects to the locker rooms, concession area, office facilities and sprawling deck areas, the city has created a marvelous facility on a shoestring budget. And they’re not finished just yet: A second waterslide was designed into the project but was set aside because of fiscal constraints. It may take a while, but everyone’s confident the second slide will be installed and operational within a few years. There’s a lot going on inside this facility, a fact that motivated us to design high-caliber systems to keep it all operating efficiently for years to come. The water, for example, turns over every five hours through 12-inch plumbing at safe, easy flow rates of 6 feet per second. A grated gutter system in the main pool features a distributed array of drain locations (for safety), and there are multiple in-floor returns. The facility indeed has something for everybody, as this schematic overview shows (left). With the bulkhead down, a set of chambers just beneath the diving stands use air power to make the waves (middle left). The rolling motion carries water and bobbing bathers the length of the pool before fanning out across the beach entry – with a little side channel transferring some of the wave action to the kiddy pool (middle right). Within eyeshot of the kiddy pool is the hydrotherapy spa (right), wrapped in a ramp designed to carry wheelchair-bound bathers into the water. On the opposite side of the facility, older kids congregate at the waterslide. The entire facility, indoors and out, is absolutely the product of its community’s desire to meet the needs of all its citizens, young and old – and to do so in such a way that they can all come together in one space at one time. The water itself is polished by 11 high-rate sand filters made by USFilter and treated with liquid chlorine delivered to the site by Hasa Chemical. The water is monitored with Strantrol ORP controllers, and Lochinvar was our source for two gas-fired heaters that crank out 2.9 million Btus between them. None of the above is unusual for large aquatic facilities, but because the competition pool doubles as a wave pool, there are certain atypical design elements. For starters, the submersible bulkhead (described in the sidebar below) is unlike any such unit we’ve ever been involved with. It required, among other things, unusual construction of the pool floor to create its niche as well as placement of special drains in the niche to prevent stagnation of water beneath the bulkhead. In addition, a flat shelf in the shallow end of the pool adjacent to the bulkhead’s location was set up so the bulkhead can be moved aside. This feature allows access to the niche for cleaning. A number of people have asked why the diving pool was installed outdoors when everything else is accessed from inside the Sierra Vista Aquatic Center. The answer is simple: It was done that way at the request of the city to keep the ceiling height down. 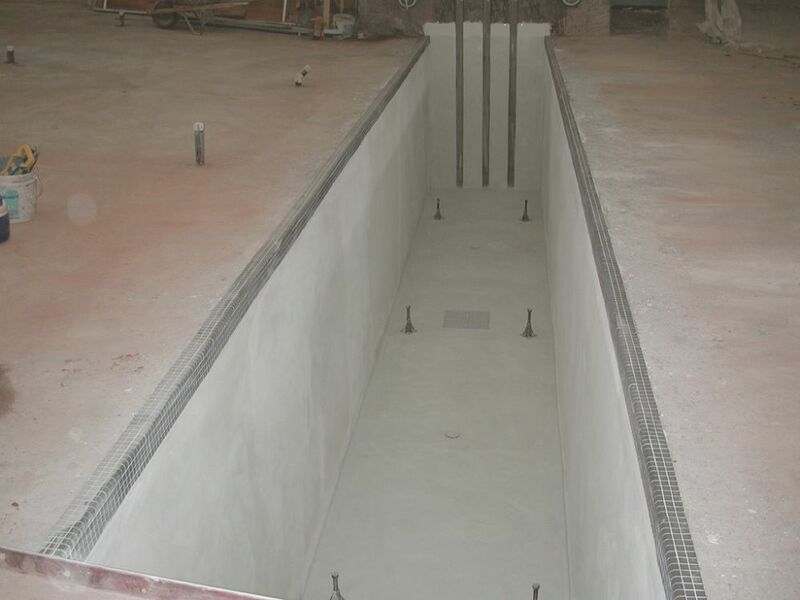 With the diving pool outdoors, it was possible to keep the ceiling height of the natatorium at 24 feet. If the diving area had been set up indoors, that height would have needed to jump 10 feet higher – a necessity that would have busted the budget. So now, the diving pool is accessed through several large sliding-glass doors off the pool deck. The diving boards are located on the south side of the 40-by-40 pool so that the sun will never shine right into divers’ eyes. The competition pool ranges in depth from 5 to 8 feet, which isn’t all that unusual, but because of the wave function, there’s 3 feet of freeboard above the water line to deck level. 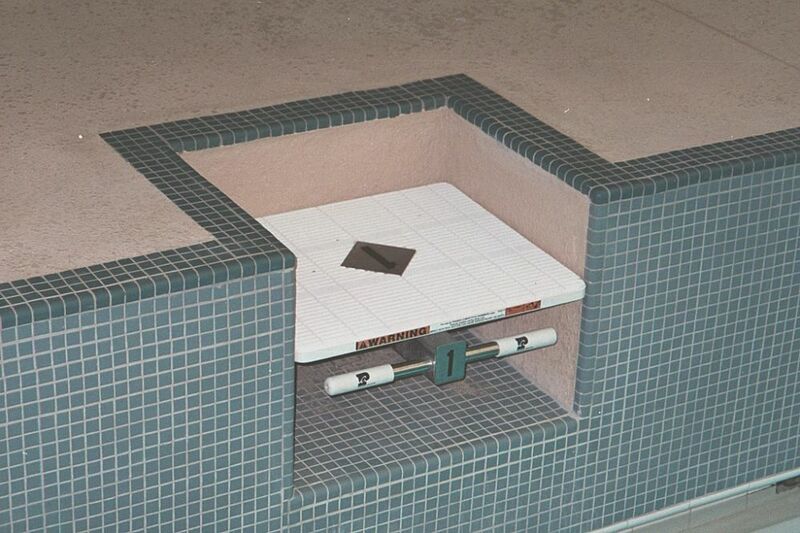 This means that the starting blocks for racing (which need to be 30 inches above the waterline) had to be recessed into the pool wall. It also means that the gutter system, so essential for competition swimming, had to be grated in order to prevent injury from limb entrapment during wave-machine operation. The gutter is unique also in that it stops and starts around the pool at the location of ladders that were inset to avoid protrusions into the pool that might pose hazards during wave-pool operation. Ultimately, this means that we had to create a manifold behind the gutter system to connect the gutter segments and hydraulically balance the flow through the system. We also used traditional skimmers in the kiddy area because of the shallow water depth, which saddled us with a hybrid set of hydraulic features that all had to be aligned for flow into a main chamber that was upsized to compensate for sudden surges from either bather load or wave action. Clearly, executing the construction of a facility of this complexity took a great deal of cooperation and coordination among the architect, the general contractor, the city, the watershape contractor and our firm. It bears mentioning that we were fortunate in working with Mark Ragel and crews from Patio Pools of Tucson and with Tom Elfrida from Patio Pools of Sierra Vista. They were brilliant in devising on-site construction solutions for tricky issues, including the forming and building of the niche for the bulkhead, the installation of the extensive plumbing system and the layout and rigging of the equipment rooms. We also appreciated the professionalism of Leon Davis of Lloyd Construction. 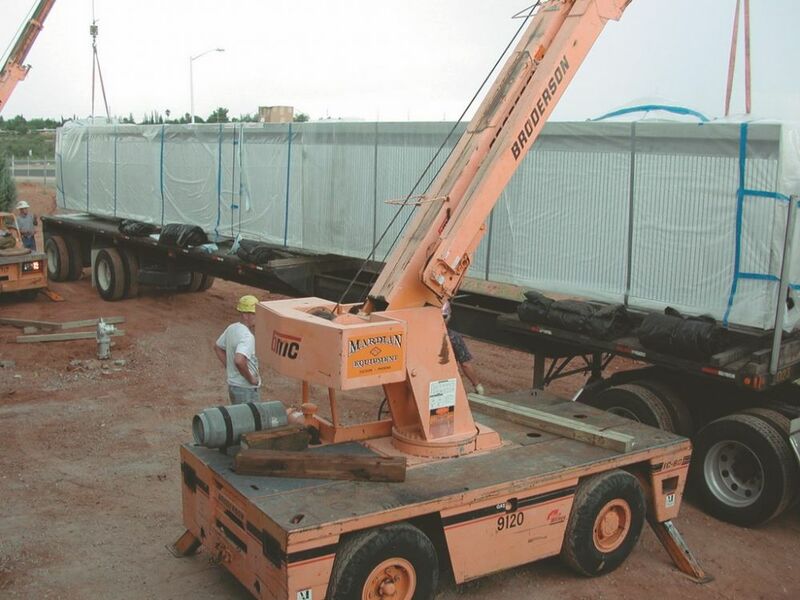 Despite problems with equipment and material deliveries and hurdles set up by late changes made by the architect and the city, the general contractor was able to keep the project moving and on schedule. The cooperation we received from city and state building officials in plan review and approval phases is also something for which we all were grateful. Given the unusual nature of the facility and the variety of its programming needs, access issues and safety considerations, the many inspectors who came on site to review our progress were both efficient and cooperative. In all our years of designing commercial aquatic facilities, it’s safe to say we’ve never been involved with a project that called for working so many activities into such a compact space with so tight a budget. We are very pleased to have been part of the project – and satisfied to know that the wonderful people of this remote desert community will have a tremendous place to relax, exercise, compete and play for generations to come. William N. Rowley, PhD, is founder of Rowley International, an aquatic consulting, design and engineering firm based in Palos Verdes Estates, Calif. One of the world’s leading designers of large commercial and competition pools, his most notable projects include partial designs for the competition pools used in the Olympic Games in Munich (1968) and Montreal (1972), and he acted as aquatic consultant for the design of the Olympic Pool Complex in Los Angeles (1984). His projects also have included a wide range of non-competition pools, including the White House pool in Washington, the Navy Basic Underwater Demolition Training Tank in Coronado, Calif., and the resort pool at the Hyatt Regency at Kaanapali Beach on Maui. Dr. Rowley is involved in a range of local, state and federal entities, consulting on construction and safety-code requirements. Scott K. Mackey, AIA, is director of architecture for Rowley International. He has more than 15 years’ experience in planning, designing and building aquatic-recreation facilities. Before taking on his current role, Mackey was a principal in the firm of Albanese/Brooks/Mackey PC in Tucson, Ariz and previously served as a vice president for Durrant Architects in Arizona and as a project director for Durrant Sports in Vancouver, British Columbia, where he worked on all types of recreational facilities.